What inspired you to start playing the drums? I saw a drummer on television when I was four who impressed me very much because of the size of his drumset and the fact that he seemed to be in charge of everything that was happening on stage, you know, counting in the song, opening the tune with a big drum fill and everyone was looking at him. He seemed to be pulling the strings in the band and that kind of intrigued me. A few days later I saw a live drummer in my local town and I walked up to the drumset after seeing the drummer on television just to check it out. I can remember the experience of standing right beside the kick drum, I was four years old and the bass drum was almost as tall as I was, and it just a very impressive feeling. I could feel the air move, it was very powerful and it was a very big, shiny, bombastic instrument. So I was hooked! What was the big breakthrough in your career? My first breakthrough was definitely working with the big national artists in Austria in the 80’s. I got exposed to the professional music scene at a very early age and I got some very good and high quality work. That allowed me to create an infrastructure for myself (financially) that was a very comfortable place to be to develop further as a player. Those were very important years for me because everything grew out of that. Everything that I do today is a result of that and I still work a lot of with the people from back then who have different positions in Europe and have stumbled up the ladder with me – musicians who have upgraded to producers or management or whatever – I still have a lot of those connections. Then there is the alternative career that I have, the whole drum career, which kind of really kicked off in 2000 – a long time after I had been working professionally. I always tried to stay out of that drum scene, I didn’t want to be the drum hero guy but a few things coincided. I had just changed my cymbal endorsement, got very interested in the Sonor giant step peddle, and at the same time an instructional video I had done in German language (there had never been one before) was released by a major distributor in Europe – it all came together and everybody asked me to do some clinics to promote these three components. I decided to do some drum festivals in Europe and that created a huge kind of buzz very quickly and within months I was asked to do a lot of big international festivals, which my sponsors hooked up. The ball started rolling from there and a few years into this it really hit me that people knew me as a drummer, not as a musician, producer or a sideman, but as a drummer. Have you picked up any tools over the years that have really helped you perform better? Of course! Every technique I have learned has helped me to perform better. My signature sticks – since I’ve had those I’ve felt really comfortable with my playing – that’s one less worry. I really feel that they are perfect for me and my style of playing. Also, my signature cymbals – a lot of signature products are basically tools that make playing easier for me as well as more enjoyable. Then there are the psychological and empirical experiences over the years. You know, performing – yes it is an art and yes it is a job but there should always be the element of fun and entertainment in it. A sense of lightness is important. I think over the years you learn to look at the whole scene, pressure and madness of it all in a different way and that has definitely helped my performing standard and the comfort that I feel when I play on tour these days. Just not taking it too seriously. I’m very serious about music and art but I only think you can perform and be a good artist if you can step back and look at the big picture from a slightly different angle. What do you think makes a great musician? Creativity, personality, skill and attitude, you know, towards other musicians in a band situation. I think those things are the most important. Do you have any good advice for young musicians who are trying to make it? this decision is life changing. You can only maintain a career and be successful if you love it. You have to feel really passionate about it because only that drive and passion will keep you disciplined and working hard. There’s a saying, only a born artist can endure the labour of becoming one, and I think it’s very true. You have too ooze the urge to perform and play and practice out of every pore of your body – only that will make you competitive, competent and confident at a later age. You need the practice, you need the extremely long, lonely, boring hours by yourself and the years of touring with small time bands to gain the skills and experience you need to maintain a healthy intellectual and emotional level throughout your career. You can get messed up so quickly in this profession so you’ve got to have your head screwed on right and you’ve got to be better than everyone else. And in order to get there you have to just work harder than everybody else and in order to do that you’ve got to love what you do. My advice is get out if you don’t – if you don’t really, really want it maybe some other job is a little more appropriate for you. It’s a tough job, it’s a tough life and you need to be a multi-tasker to succeed. Not only just to be able to make it work, especially if you have a family, relationship or other interest but you have to be a multitasker within the field itself. Nowadays you not only have to be the best drummer you can be but also the best programmer you can be, the best producer you can be and the best engineer you can be. You have to know about distribution, negotiations, law, contracts, publishing, royalties etc. – there are so many components and so many levels and you have to have a drivers license! All these little factors that you’ve got to have in place and not be afraid to be the first one at the gig and the last one that goes home. It’s the same in the studio. As the drummer you are the heart of the band and you’ll be blamed for any timing problems in the world – you’ve got to have a tough skin and a real love for the music. 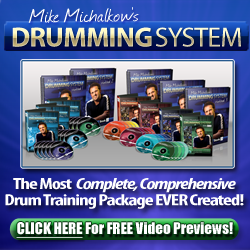 Interview taken from The Psychology Of Drumming.